Fibromyalgia nutrition is enhanced by both Juicing and Blending; but, the two are different and both serve their respective specific purpose in assimilation of essential nutrients; juicing facilitates fibromyalgia nutrition more quickly into cells, and is great when people are very nutrient deficient, are feeling toxic and weighed down, or when experiencing an IBS flare. As a colon therapist, I have worked with various digestive illnesses, and that is where vegetable juicing is going to be preferred over blending in some cases. Also, there are some nutritious substances that are not always tolerated through blending or eating raw, yet can be more easily tolerated when juiced instead. That said, blending and/or juicing do not need to be done every day to be effective. Although, as we become more efficient, we will want to make this more of a daily practice which is a lifestyle that supports our well-being and energy levels. Consider the following suggestions and make juicing / blending part of your weekly schedule. PLEASE NOTE: The first half of this article details JUICING while the second half details BLENDING. Also, you can learn more about my suggestions for your diet for fibromyalgia and its co-conditions at best diet for fibromyalgia. As an avid juicer for over 30 years now, I still sing the praises of "healthy" juices made at home. If you don’t have or cannot afford a juicer at this time and you want/need to be juicing, make it a priority. Juicing for fibromyalgia is the optimal way to get raw, live nutrients, minerals and enzymes into the body and bloodstream. This is the BEST infusion for fibromyalgia nutrition we can give ourselves, especially when sick or deficient. Focus on organic vegetables and greens when juicing. Fruit is not the best option, especially with hypoglycemia or any blood sugar issues. An exception to the rule is green apple which mixes well with vegetables and is low glycemic. 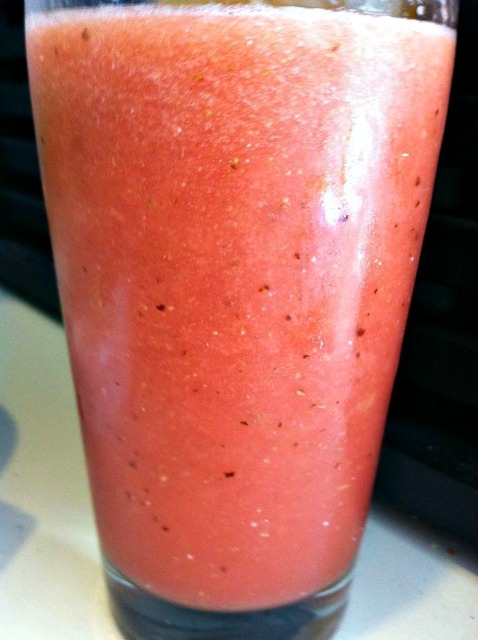 I share some very good vegetable juice recipes so you won’t miss the fruit. Some are so good, you would think there is fruit of some kind in there!! Now, because some greens contain goitrogens or oxalates, it is good to go slow if you have any thyroid or kidney issues. Yet, please understand that there is a lot of mis-information out there and juicing organic vegetables is still one of the best things we can do for a healthy body and fibromyalgia nutrition. This is especially true considering the world we live in and the toxins we are exposed to every day. Parsley should be taken in small amounts as it is high in oxalates. Use organic vegetables when possible; however, if using conventional, at least wash with vinegar and baking soda or hydrogen peroxide. Using a large bowl in the sink is helpful. Avoid cilantro if you have mercury amalgams or are doing any kind of chelation of heavy metals, as it can move metals around the body. You may not be able to juice every day and for some that is not practical. Just incorporate juicing for fibromyalgia nutrition into your weekly schedule. It is part of healthy, natural healing. To create better assimilation of nutrients, I always chew some of whatever I am juicing while making the juice. For example, set aside some greens, pieces of carrot, fennel, etc. and chew well to activate digestion; just a small amount is fine. Taking in juice needs to be done slowly as well, even ‘chewing’ the juice to further activate digestive fire and assimilate fibromyalgia nutrition. Avoid drinking the juice too fast. In addition, having a small amount of raw fat (a teaspoon is fine) such as olive oil, coconut oil, flax oil or avocado before OR with your juice will help to better assimilate juice nutrients. Juicing for fibromyalgia nutrition can be done anytime, however, "fasting with juice" is another idea only for those who are practiced in juicing. Juice fasting is good starting in small increments. We don’t want to set ourselves up to fail by trying to fast with juice for too long at one time. Start with 4 hours, then 8 hours, then a full day or weekend. And also eat raw foods during that time if needed, to avoid detoxing too fast or losing resolve or motivation. NOTE: JUICE FASTING FOR PERIODS OF TIME MAY NEED TO BE DONE UNDER MEDICAL SUPERVISION AND IS NOT APPROPRIATE FOR EVERYONE. Remember that the very best way for ongoing detox is through daily lifestyle. A juicing detox, fast, or other means of cleansing can fall short if we have not created a lifestyle to support our efforts. Eliminating food allergens, reducing stress and residing in a nontoxic environment are all essential. Get started juicing for fibromyalgia nutrition today; just be sure to make it count. My favorite juicer is shown under Fibro kitchen tools. The Omega stainless steel juices everything well, has a 10 yr. warranty, and is an excellent choice in juicers. However, there are a few other good ones which are lower cost and which I also show on the Fibro Kitchen Tools page. 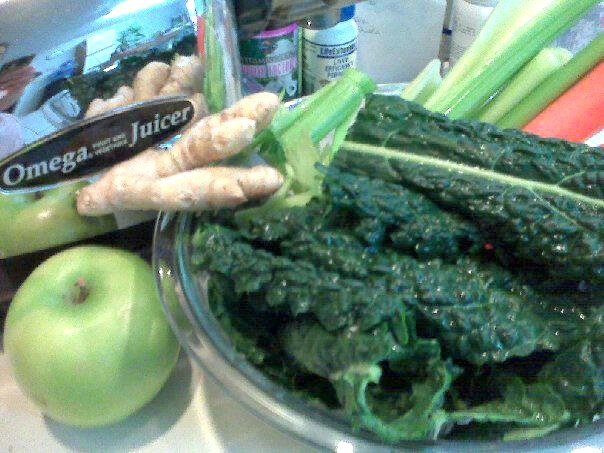 My favorite organic juice combination: lacinato kale, celery, carrot, green apple, ginger root. The chlorophyll, minerals, calcium, and ginger root are great for healing inflammation in the body and so essential for fibromyalgia nutrition. 2 cucumbers (always have a neutral base), 4 ribs of celery, 2 leaves lacinato kale OR 1 cup spinach. 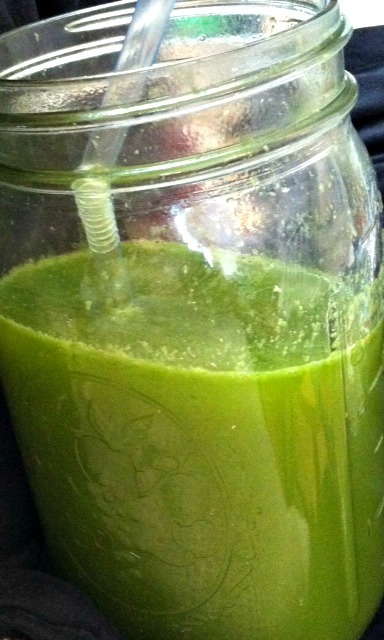 1 small handful of wheatgrass, a few sprigs of cilantro OR parsely, 1 green apple, 1/2 inch pc. ginger root. 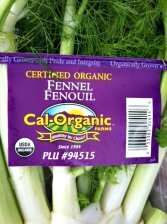 Yes, fennel is an excellent addition for better digestion. It's a great digestive herb. I make a tea from bulk herbs with extra fennel and have this during my travels. It supports digestion, relieves that gassy feeling you can get especially while traveling and has a pleasant taste. Mix with anise, rosemary, etc...any other herbs for your specific needs. The plant can also be juiced, and is an excellent addition to any vegetable juice. Look for it next time you are at the market. 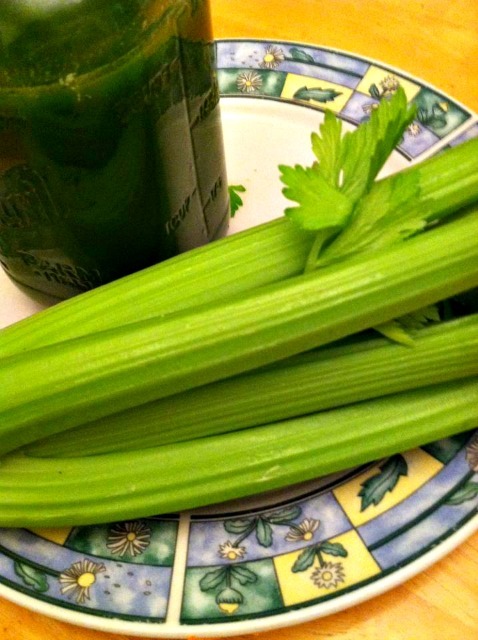 While on the subject of juicing, organic celery is an essential addition to vegetable juices. Celery helps to remove excess androgens from the body as well as giving a great supply of minerals. I was at a juice bar many years ago while traveling and the lady in front of me said " no celery, it's too high in sodium" regarding her juice selection. She had no clue that celery may have been exactly what she needed to balance hormones and help the body to RELEASE excess water and toxins. 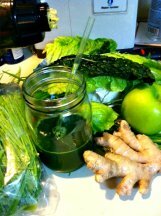 My juice today: All organic celery, spinach, romaine hearts, carrot, green apple and ginger root. Lacinato kale is another favorite of mine. Excellent fruit choice. High in malic acid (an essential element for fibromyalgia nutrition) and lower glycemic than other fruit making them great for us. They are also better combined than any other fruit, when making vegetable juice for example. Generally use 1-2 green apples per 16 oz. of vegetable combination juice. 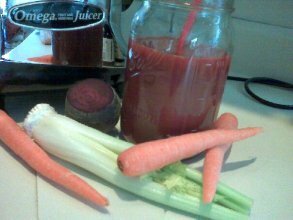 Raw vegetable juices made at home are essential to healing, detoxing, and getting life-giving fibromyalgia nutrition into the cells. Bile movers such as beets are great for the liver/gallbladder because when the liver and bile ducts are congested, this can cause pain in the body. 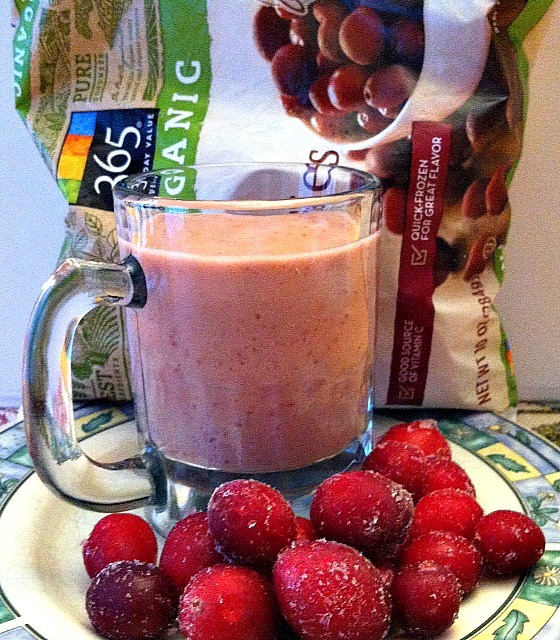 A cleansing neutral juice recipe without fruit sugars. Note: Please use organic when possible. 1 medium or two small cucumbers. 1 inch piece ginger root. 1 tsp. Unrefined Apple Cider Vinegar. Optional: A few strands of cilantro for heavy metal detoxing. Juice and enjoy anytime of day. 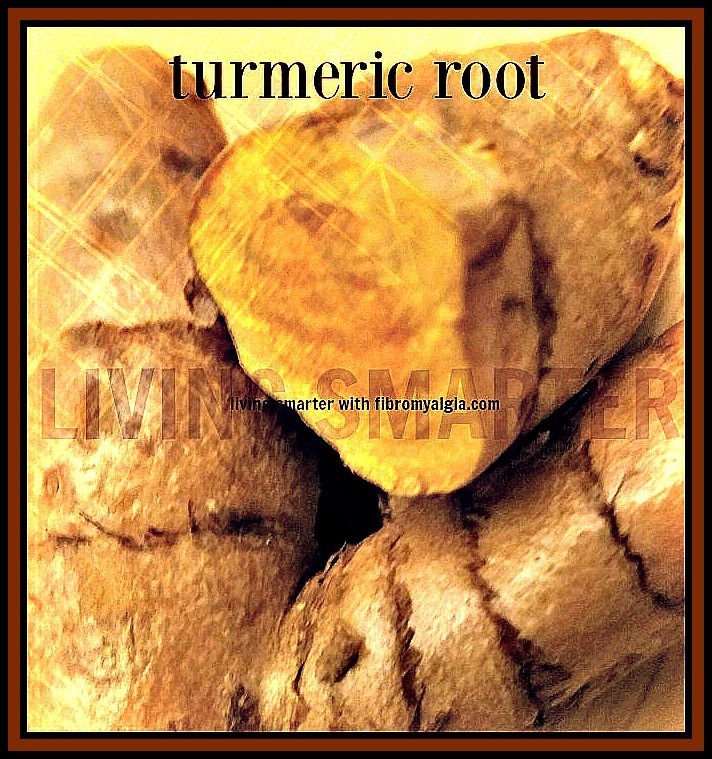 Easy and great for inflammation, but you don't need a lot of ingredients!! I mix in low glycemic fruit such as green apple, flax meal, greens for cleansing chlorophyll, etc. When blending, always start with less liquid or water, then add more after blending, to avoid it becoming frothy which can affect digestion. Be sure to get enough protein if going vegetarian, as protein is so very essential to fibromyalgia nutrition and to the healing of one's body. Just be sure to follow the essential guidelines on the Nutrition Tips page for the best time to ingest protein as well as the optimal time for 'rest inducing' whole food carbohydrates. There is a time and place for both juicing and blending. Above, I give many suggestions for juicing and how to make it more beneficial. For this article, let’s focus on blended foods and the best combinations for both synergy and health. 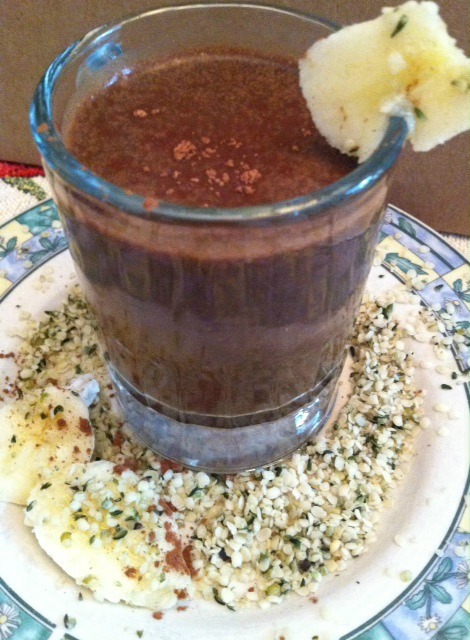 I eat a blender drink most days; it's a great choice for fibromyalgia nutrition. Blending foods and drinks for your fibromyalgia nutrition is the optimal way to start the process of nutrient breakdown and absorption. It can take time to experiment and find what works best, what is both healthy and palatable, and how to make blending more time efficient. If it becomes a hassle, or we dislike the taste, then we won’t be consistent. Also remember that as with anything, the more we do it, the better we become at making it work for us, so keep working at it. What follows are just a few of my tips for better blender drinks. 1. Always use variety and continue to try new ingredients. This will keep it fun and interesting. I have personally gotten into "blending ruts" before where I had to change things up and expand my fruit and vegetable variety. This also renews our motivation. 2. When blending, always start with a smaller amount of liquid to avoid the frothy effect and add more liquid AFTER blending. 3. Always blend protein powders with enough bulk items and fiber such as seed meal. This will create a smoother texture and better palatability. (If you’ve been to any gym, you often see people toting a shaker bottle with protein powder and water only. This might be fine for some people, but I have found that people with sensitive GI tracts really need some bulk in their blended drinks). By bulk, I mean enough fruit and vegetable matter to blend well. Please note that some people with IBS or digestive inflammation may need to focus MORE on vegetable juicing instead of blending until there is no inflammation present. Also be aware of using excess fruit. Vegetables, greens, spinach are excellent additions and should be used in greater amounts to avoid blood sugar spikes. A small amount of fruit goes a long way. Generally, ½-1 cup of fruit is adequate. (One of my tricks is to add about ½ cup frozen green beans to my protein blender drinks. This is a great low calorie addition without lending any vegetable taste; the taste is very neutral and you won’t know they are there!!). 4. Adding just a scant amount (a tsp.) of coconut flour is another way to bulken the drinks due to the high fiber content in coconut flour. Other fiber additions include seed meal of any kind including pumpkin, chia, flax or hemp seed. The fiber additions make for a more evenly blended drink and smoother texture. 5. If starting with ingredients that are not frozen, it helps to add ½-1 cup crushed ice or cubes. I have sometimes forgotten this when using no frozen ingredients, and find that it really affects the taste and enjoyment. Keep it a little cool and refreshing! 6. Using enough healthy raw fat also gives a better texture. 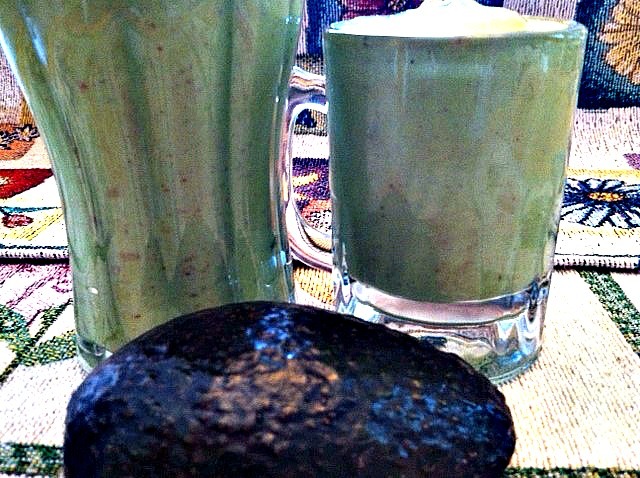 Using half an avocado per drink is adequate and will lend a smoother consistency. Soaked almonds or walnuts also work great and create a nice taste. "Healthy", raw (unheated) fats are essential for the entire fibro body. They create energy, balance blood sugar and are essential for brain health. The BEST way to start the day, and the best way to fibromyalgia nutrition. 7. It’s important that we adjust our palate when creating blender drinks. We want to focus on low glycemic ingredients. Over time, our taste and craving will adjust, and we will start to prefer less of a sweet taste. Even excessive use of stevia, zylitol or other more natural low calorie sweeteners can keep us ‘needing’ that sweet taste. These are also best used in moderation . 8. How do you take YOUR blender drink? I prefer to take mine with a spoon and glass. I’ve done this for years and it creates a more satisfying ‘meal’ this way. Be careful if using a straw which can cause gas or bloating if too much air is taken in. 9. Which blender is best? I prefer a high powered blender that will blend anything well. Also with a little more investment up front, we can get an extended warranty. Some brands give warranties up to 7-10 years. This gives us reassurance and greater commitment to our healthy lifestyle as well. That said, any blender is better than no blender. 10. See below for more options when using fruit in a blender drink. Start blending today. It’s a smart investment for your healthier fibro body and lifestyle. 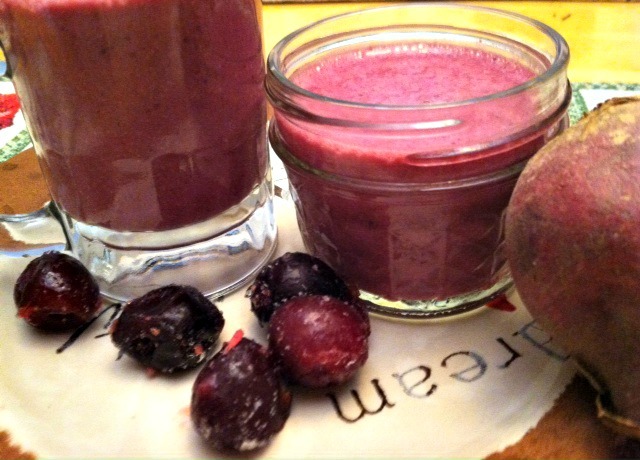 Cherry, Beet and Goji, oh my !! Just enough water to cover ingredients in blender. NOTE: Add more water after blending if needed. Blend in high powered blender and enjoy your antioxidant 'reds' drink..
(Not familiar with Plantfusion allergen free protein ? Don't throw away that pineapple core. 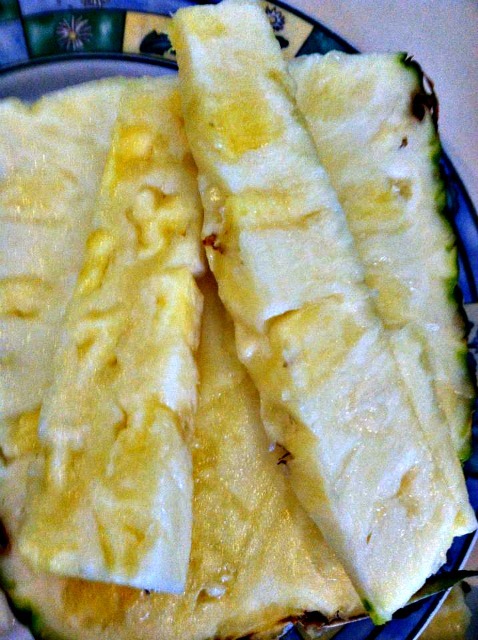 It's a great addition to any blender protein drink, and is full of bromelain for anti-inflammatory factors. I vary the ingredients in my morning blender drink to keep it interesting. My additions often include the pineapple core (also lower in sugars than the outer part) a handful of greens, seed meal, Genesis Today probiotic greens, water, ice and of course Original Plantfusion protein. All great fibromyalgia nutrition! Allergen free and energy full! What are you blending today? See suggestions for utilizing Blending & Juicing in your daily routine at Nutrition Tips. A great alkalizer and kidney tonic. I've been enjoying this one for years and it is still one of my favorite healthy drinks for summer! • 2 cups watermelon with white inner rind and seeds (organic if possible). Mix in vitamix or high power blender about 30 seconds or until blended well. It is best to avoid eating watermelon after meals or mixing with starch or proteins. That is not good food combining and will cause other food to ferment in the GI tract. Be sure to include the seeds, which are an excellent kidney cleanser. Don't worry, they blend well and give the drink a good texture. Add enough purified water to cover ingredients.. Kids and adults alike love the taste of chocolate covered banana, and combined with the healthy protein source of Plantfusion, it makes a great low glycemic, higher protein drink to keep the body in balance. Always remember to add LESS water before blending to avoid the frothy effect, and then add more liquid AFTER blending if needed. And, if you would like additional protein that is tasteless and blends well in any high powered blender drink, the one below is the one I use. Good for skin, hair, and muscle health.